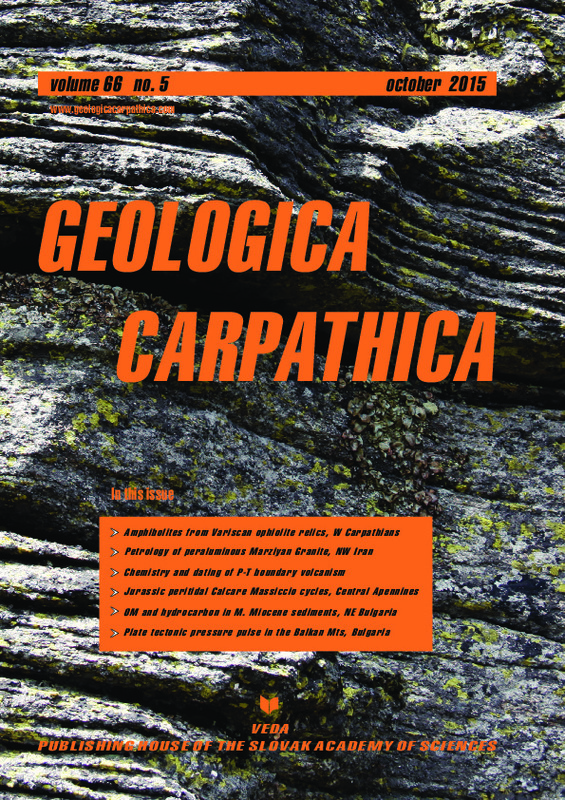 Abstract: Three small bodies of amphibolites and associated graphitic gneisses from the Suchý and Malá Magura Mountains (Tatric Megaunit, central Western Carpathians) have been studied by petrographic and geochemical methods. Isolated, fault-bounded bodies first hundreds of meters in size are located in the complex of the Early Paleozoic paragneisses and migmatites intruded by the Lower Carboniferous granitoid rocks. Amphibolites (locally actinolite schists) were formed from effusive basalts, dolerites or isotropic gabbros hydrothermally altered and veined before the regional metamorphic transformation. Distribution of the trace elements relatively immobile during the metamorphic alteration (HFSE, REE, Cr, V, Sc) is similar to E-MORB type in the Malá Magura Mountain or to N-MORB/E-MORB types in the Suchý Mountain. Graphitic gneisses to metacherts are rich in silica (up to 88 wt. %) and Ctot, poor in other major element contents and display negative Ce-anomaly, enrichment in HREE, V, Cr and U. They were probably originally deposited as non-carbonate and silica-rich deep-sea sediments in anoxic conditions. The oceanic provenance of amphibolites and related graphitic gneisses clearly indicates their oceanic crust affinity and identity with the upper- most part of the ophiolite sequence. Ophiolite bodies from the Suchý and Malá Magura Mountains are supposed to be relic fault blocks identical with the Upper Devonian Pernek Group which represents a Variscan ophiolite nappe pre- served to large extent in the Malé Karpaty Mountains located in the Tatric Megaunit further to the southwest. All these ophiolite relics are vestiges of the original ophiolite suture created by oceanic closure in the Lower Carboniferous. Abstract: The Marziyan granites are located in the north of Azna and crop out in the Sanandaj-Sirjan metamorphic belt. These rocks contain minerals such as quartz, K-feldspars, plagioclase, biotite, muscovite, garnet, tourmaline and minor sillimanite. The mineral chemistry of biotite indicates Fe-rich (siderophyllite), low TiO2, high Al2O3, and low MgO nature, suggesting considerable Al concentration in the source magma. These biotites crystallized from peraluminous S-type granite magma belonging to the ilmenite series. The white mica is rich in alumina and has muscovite composition. The peraluminous nature of these rocks is manifested by their remarkably high SiO2, Al2O3 and high molar A/CNK (> 1.1) ratio. The latter feature is reflected by the presence of garnet and muscovite. All field observations, petrography, mineral chemistry and petrology evidence indicate a peraluminous, S-type nature of the Marziyan granitic rocks that formed by partial melting of metapelite rocks in the mid to upper crust possibly under vapour-absent conditions. These rocks display geochemical characteristics that span the medium to high-K and calc-alkaline nature and profound chemical features typical of syn-collisional magmatism during collision of the Afro-Arabian continental plate and the Central Iranian microplate. Abstract: Several magmatic events based on U-Pb zircon geochronology were recognized in the Permian sedimentary succession of the Northern Gemeric Unit (NGU). The Kungurian magmatic event is dominant. The later magmatism stage was documented at the Permian-Triassic boundary. The detrital zircon assemblages from surrounding sediments docu- mented the Sakmarian magmatic age. The post-orogenic extensional/transtensional faulting controlled the magma ascent and its emplacement. The magmatic products are represented by the calc-alkaline volcanic rocks, ranging from basaltic metaandesite to metarhyolite, associated with subordinate metabasalt. The whole group of the studied NGU Permian metavolcanics has values for the Nb/La ratio at (0.44—0.27) and for the Nb/U ratio at (9.55—4.18), which suggests that they represent mainly crustal melts. Magma derivation from continental crust or underplated crust is also indicated by high values of Y/Nb ratios, ranging from 1.63 to 4.01. The new 206U—238Pb zircon ages (concordia age at 269 ± 7 Ma) confirm the dominant Kungurian volcanic event in the NGU Permian sedimentary basin. Simultaneously, the Permian-Triassic boundary volcanism at 251 ± 4 Ma has been found for the first time. The NGU Permian volcanic activity was related to a polyphase extensional tectonic regime. Based on the new and previous U-Pb zircon ages, the bulk of the NGU Permian magmatic activity occurred during the Sakmarian and Kungurian. It was linked to the post-orogenic transpression/transtension tectonic movements that reflected the consolidation of the Variscan orogenic belt. The Permian-Triassic boundary magmatism was accompanied by extension, connected with the beginning of the Alpine Wilson cycle. Abstract: This paper shows the environmental changes and high-frequency cyclicity recorded by Lower Jurassic shal- low-water carbonates known as the Calcare Massiccio Formation which crop out in the central Apennines of Italy. Three types of sedimentary cycle bounded by subaerial erosion have been recognized: Type I consists of a shallowing upward cycle with oncoidal floatstones to rudstones passing gradationally up into peloidal packstone alternating with cryptoalgal laminites and often bounded by desiccation cracks and pisolitic-peloidal wackestones indicating a period of subaerial exposure. Type II shows a symmetrical trend in terms of facies arrangement with peloidal packstones and cryptoalgal laminites present both at the base and in the upper portion of the cycle, separated by oncoidal floatstones to rudstones. Type III displays a shallowing upward trend with an initial erosion surface overlain by oncoidal floatstones to rudstones that, in turn, are capped by pisolitic-peloidal wackestones and desiccation sheet cracks. Sheet cracks at the top of cycles formed during the initial phase of subaerial exposure were successively enlarged by dissolution during prolonged subaerial exposure. The following sea-level fall produced dissolution cavities in subtidal facies, while the successive sea-level rise resulted in the precipitation of marine cements in dissolution cavities. Spectral analysis re- vealed six peaks, five of which are consistent with orbital cycles. While a tectonic control cannot be disregarded, the main signal recorded by the sedimentary succession points toward a main control related to orbital forcing. High frequency sea-level fluctuations also controlled diagenetic processes. Abstract: The depositional environments and hydrocarbon potential of the siliciclastic, clayey and carbonate sedi- ments from the Middle Miocene succession in the Varna-Balchik Depression, located in the south-eastern parts of the Moesian Platform, were studied using core and outcrop samples. Based on the lithology and resistivity log the succession is subdivided from base to top into five units. Siliciclastic sedimentation prevailed in the lower parts of units I and II, whereas their upper parts are dominated by carbonate rocks. Unit III is represented by laminated clays and biodetritic limestone. Units IV and V are represented by aragonitic sediments and biomicritic limestones, corre- lated with the Upper Miocene Topola and Karvuna Formations, respectively. Biogenic silica in the form of diatom frustules and sponge spicules correlates subunit IIa and unit III to the lower and upper parts of the Middle Miocene Euxinograd Formation. Both (sub)units contain organic carbon contents in the order of 1 to 2 wt. % (median: 0.8 for subunit IIa; 1.3 for unit III), locally up to 4 wt. %. Based on Hydrogen Index values (HI) and alkane distribution pattern, the kerogen is mainly type II in subunit IIa (average HI = 324 mg HC/g TOC) and type III in unit III (average HI ~ 200 mg HC/g TOC). TOC and Rock Eval data show that subunit IIa holds a fair (to good) hydrocarbon genera- tive potential for oil, whereas the upper 5 m of unit III holds a good (to fair) potential with the possibility to generate gas and minor oil. The rocks of both units are immature in the study area. Generally low sulphur contents are prob- ably due to deposition in environments with reduced salinity. Normal marine conditions are suggested for unit III. Biomarker composition is typical for mixed marine and terrestrial organic matter and suggests deposition in dysoxic to anoxic environments. Abstract: The EU-TecNet monitoring network uses customized three-dimensional extensometers to record transient de- formations across individual faults. This paper presents the first results from two newly established monitoring points in the Balkan Mountains in Bulgaria. The data from Saeva Dupka, recorded across an EEN-WWS striking fault, show sinis- tral strike-slip along the fault and subsidence of the southern block. Much of the subsidence occurred around the time of the distal MW= 5.6 Pernik Earthquake. An important transient deformation event, which began in autumn 2012, was reflected by significant compression and following extension, across the monitored fault. The data from Bacho Kiro, recorded across a NE—SW striking fault, show sinistral strike-slip along the fault and subsidence of the north-western block. The same important deformation event was reflected by changes in the strike-slip, dip-slip, and horizontal opening/closing trends. These results have been compared to data from other monitoring points in the Western Carpathians, External Dinarides, and Tian Shan. Many of the sites show evidence of simultaneous displacement anomalies and this observation is interpreted as a reflection of the plate-wide propagation of a tectonic pressure pulse towards the end of 2012.